Uluru, the Great Barrier Reef, the Big Lap: forget them all. In our last magazine issue, 20 of Australia’s leading travel experts named this little-known experience – a cruise around the remote Kimberley coastline – the best holiday in all of Australia. We sent Rebecca Taylor and her camera to document why. The cost. The distance. The climate. The time. Visiting the Kimberley presents enough serious hurdles to give any traveller second thoughts, which is why only 270,000 people come to the area each year. But set foot here, and you’ll wonder why on Earth you hadn’t made the journey sooner. As you might imagine, this top western corner of Australian coastline is the perfect antidote to a life spent sucking second-hand cigarette smoke on city streets. You breathe freely here. But things are even better on a purpose-built expedition ship, where you cruise around nameless places, exploring coves, islands, and million-year-old gorges that are otherwise impossible to access. When you’ve sailed as far as you can and your ship will take you no further, you don’t stop, but jump into a rigid, inflatable zodiac to explore even further; sometimes landing on a deserted beach with waves crashing in around you and jagged cliffs looming over your head. Then, as the sun sets each day and you speed back to the five-star luxury of your ship, shaking off your life jacket, there’s a soothing shower to stand under, before you sit down to several nourishing courses with your fellow, like-minded travellers. There are several operators offering tours through the area, each with their own itinerary and personality, but my 10-day expedition, which begins in Broome and ends in Darwin, takes place on board luxury expedition ship National Geographic Orion – known as MV Orion until late last year, when it was acquired by Lindblad Expeditions (an American company considered by many to be the pioneer of expedition cruising). Of course, you could debate forever about which operator is the ‘best’; ultimately, each has its own merits, but the National Geographic Orion experience… well, let’s let the pictures speak for themselves. It is a 40-degree day when we gratefully swap the hot sands of Broome for on board salt spray and sail north-east, waking the following morning to find a paradise amidst a collection of islands called the Buccaneer Archipelago (many of which, aside from being beautiful, contain high-grade silver and iron ore deposits – though that’s a different topic altogether). We spend the morning admiring ancient rock formations and cruising through stunning turquoise waters, only pausing when a pod of curious bottlenose dolphins come right up to the zodiacs to meet us; playfully chasing each other and soaring high into the air in a flamboyant display of agility. By that afternoon we’re diving into the cool, fresh water of Crocodile Creek – ironically the only place where you can swim undisturbed by crocs (though, naturally, the staff still checks for their presence) before heading on the move again by nightfall – north along the coast, towards Talbot Bay. David Attenborough described the Horizontal Falls as “one of the greatest natural wonders of the world” and, based on the science of the place alone, his statement holds true. The sun is just rising by the time we have piled into zodiacs and are motoring towards this incredible phenomenon – a side effect of the powerful tidal currents that hurtle in and out from the shore here at up to 10 metres per tidal cycle. At the falls, these tides – the largest in the Southern Hemisphere – are forced to squeeze through one tiny gap, then another between two sandstone cliff faces, creating a high-velocity series of dips and whorls that our zodiac ventures scarily close to, the throttle going at full pelt just to move inches at a time. On the lazy cruise back to the ship, we spot tiger sharks, Australian kestrels, brahminy kites and a particularly beautiful white-bellied sea eagle, who sits perched high above the gorge waiting for a glimmer of something edible amidst the shimmering turquoise landscape. It’s only day two, but you can’t over-emphasise the magic of this area on a stiff pair of shoulders. It’s difficult to capture the grandeur of the saltwater cascades of Montgomery Reef. Spanning some 300-square kilometres, Monty Reef – as the staff calls it – experiences the same 10-metre high tides as the Horizontal Falls; causing the reef to flood, then rise out of the sea twice each day. The net effect – vast arrays of unsuspecting sea life, stranded on the seemingly endless coral plains, surrounded by crystalline waters gushing with purpose into the pristine, life-filled alleyways between the rising platforms – was once labelled by travel journalist John Borthwick as “perhaps the most astonishing marine spectacle in the country”. At the very least, it is the most underrated. We see cormorants, egrets and other opportunistic wading birds raiding the reef like an open pantry, and look out for dugongs, crocs, sharks, humpback whales, sea snakes and majestic green sea turtles, who play a killer game of hide and seek with the camera-wielding travellers among us. That afternoon, members of the Worora tribe share some of the ancient Aboriginal artworks to be found on nearby Steep Island. The collection of galleries, which we must trek deep into the bush on this fortress of natural treasures to see, depict supreme spirit ancestors of this tribe, the sacred Wandjina figures. It is believed that if the Wandjina paintings are left to fade, the wet season, which brings food and growth, won’t come. Among our guides is a young, earnest man named Callum, a direct descendant of these ancient people, who explains that it is now his responsibility and right to restore the paintings in this area. Sitting in the cliff-top cave, listening to him tell of the rock art’s history is a surreal, humbling experience. No Kimberley experience is really complete without an aerial perspective – especially at the mouth of the Hunter River, where the beach of Naturaliste Island makes for an easy helipad launch. From the air you can see everything: the ship, the mammoth mountain ranges; the Hunter River, winding its way into the distance; and the pièce de résistance: the three consecutive waterfalls that make up Mitchell Falls. Aside from a spectacular view, the Mitchell Falls area also serves as a place of cultural and spiritual significance for the local Wunambal people who have lived in the vicinity of Ngauwudu (Mitchell Plateau) for thousands of years. That afternoon we venture deep into crocodile territory, taking zodiacs into the mangroves lining the Hunter River. With eyes glued to the river banks, we spot numerous heavy foot (and tail) prints in the mud – though no crocs. At 90 metres high and almost 90 metres deep, King George Falls is the largest single-drop falls in the Kimberley (and no easy climb, considering the 80-degree incline, 1.5-metre boulders and scorching heat). Despite that, the breathtaking view from the top, with its violent riot of colours and primordial grandeur (not to mention the chilled champagne and croissants awaiting us back at the bottom) make this not just a trip highlight, but a lifelong travel highlight. 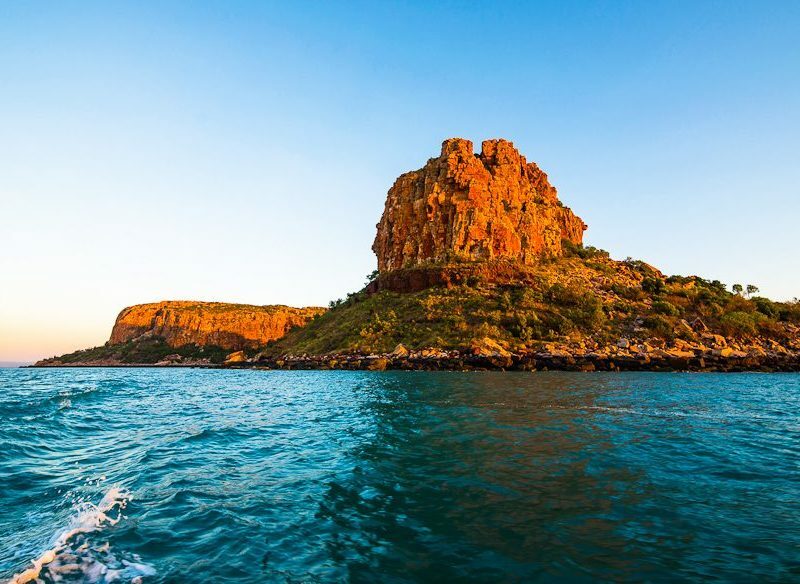 Though there is more cruising to be had – two lazy days from Wyndham to Darwin, in fact – we take an aerial flight over the Argyle Diamond Mine and the incredible Bungle Bungle Ranges in Purnululu National Park, which becomes the top note of this trip’s crescendo. Moon-like craters, long, deep gouges in the land’s surface and those striped, beehive-like domes, rising up to 300 metres above ground, are an almost otherworldly sight; so much so that I dream about the experience that night. When we disembark in Darwin – ready to repeat the trip immediately – it is with the knowledge that I will return. The Kimberley is not a once-in-a-lifetime place, as it turns out; it is a place to spend as much of a lifetime as possible. • The 11-day ‘Kimberley Dreaming’ cruise on board the National Geographic Orion departs from Broome to Darwin, and vice versa, several times between May and August each year (check website for dates). We’d recommend arriving the day before departure, just in case of flight delays (the ship departs on time). • Prices for the entire trip range from $7965 – $19,180 per person, depending on room type. • Alcohol is not included but there are various packages available when booking and on board. • The Mitchell Falls chopper flight is additional; from $515 per person. • Other optional tours are available (such as a fast boat ride through the Horizontal Falls, and other helicopter tours), but there are more than enough inclusive activities to keep you entertained. Visit au.expeditions.com/reservations/whats-included for more details on inclusions. • Be sure to pack your passport; it’s needed when the ship makes a very brief technical stop at Com, East Timor. • Happily, it’s unlikely you’ll get too seasick – seas are quite calm here, and the ship is equipped with modern stabilisation technology. However, there are possible rough seas near East Timor, so pack tablets just in case. • If you want to see the Kimberley in its full glory, book a trip for the earlier months – when waterfalls are gushing and everything is green from the wet season. The later months bring more comfortable temperatures, however. Decisions, decisions!